How can I get positive depth when using the orientation mode? The normal depth scale is set to positive depth. 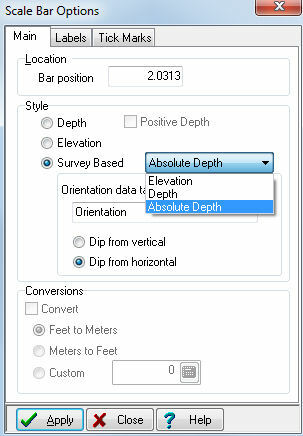 Just set your scalebar to "Absolute Depth" which is the third option in the Survey-Based Style settings. I have tried using the abs. depth function, but end up with the wrong depth, since it's not taking the elevation height into account when calculating the depth. Look at the difference at the depth in the figure below. I'm having difficulty seeing where the problem lies since both depth scales appear to be the same, and they are offset the same amount from the elevation scale. Do you have the surface elevation defined in the DAT file's Setup tab? To proceed further with data-specific questions, it would be helpful to communicate via email, and to have access to your log design (.LDFX file) and your data file (.DAT file). Please address this to our support box: support at rockware.com. The depth to the left is measured depth (MD), the middle depth is TVDSS (or elevation) calculated from orientation and to the right abs depth also calc. from orientation. The TVDSS depths are correct, I only want them to be shown as possitive. What to do? 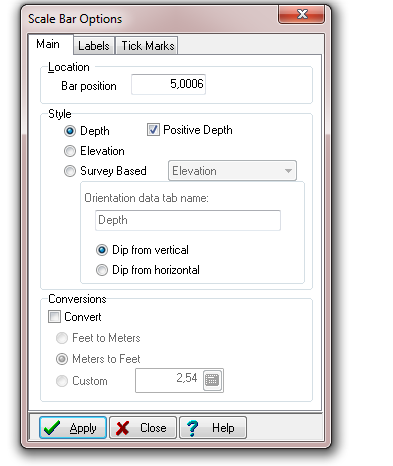 The middle scale bar is set up to display elevation values, not depths. Since the surface elevation of the well is defined at 133, then at a measured depth of 5655, the elevations will be negative. What can I do to get the numbers positive? Is'n there a way to display then without the minus sign? 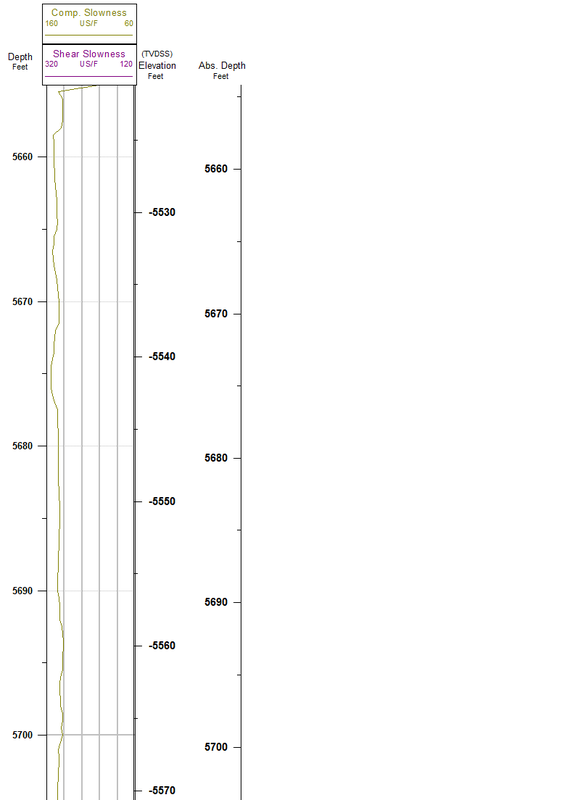 There is no capability of displaying elevations below sea level as positive values in a Logplot scale bar. 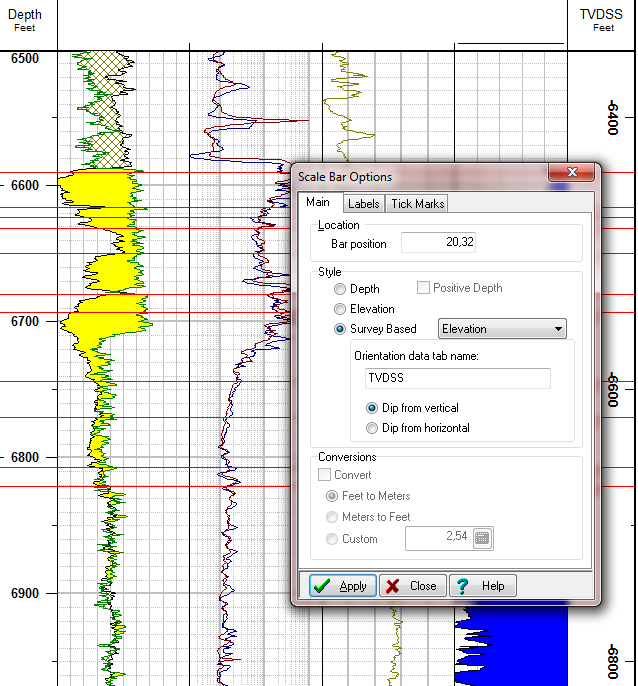 True vertical depths can be displayed as positive or negative values, but not elevations.